KaiserAir is the only full-service aircraft management company in the San Francisco Bay Area. We provide a full line of aircraft services, and our 60+ years of experience in safe flying, dependability, and professional aviation services make us the leader in personalized aircraft management. KaiserAir is recognized industry-wide for providing professional, managed services for the past 58 years. In addition to more than 40+ years of international flying experience, we have been flying domestically for 65+ years. Our organizational structure is well-established, and our complete vertical integration within the industry gives us unique insight into all areas of aviation. We are both a buyer and seller of all aviation services. By selecting KaiserAir to manage your aircraft, you have the option to place it on our FAA Part 135 Air Charter Certificate. Our industry leading charter department can help you off-set costs and provide additional tax benefits for your aviation assets. KaiserAir is experienced in handling last-minute and emergency situations. 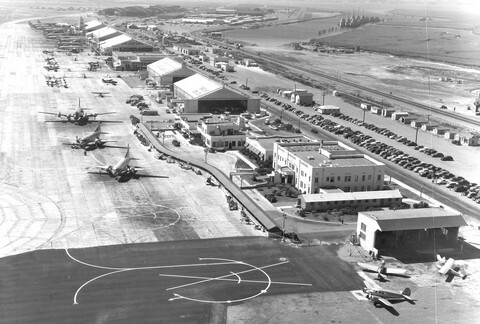 KaiserAir’s Oakland Jet Center facilities can suitably house your aircraft, flight staff, and personnel. KaiserAir's managed fleet enjoys volume discounts at Oakland and Santa Rosa Jet Centers. When your aircraft is on the road our Fuel Manager negotiates fleet fuel discount prices at other than Oakland for all managed flights to lower aircraft operating costs. KaiserAir’s full-service maintenance operation provide a 15-20% cost savings from retail and minimize the necessity to ferry the aircraft for maintenance, resulting in lower operating costs. We handle every aspect of aviation from nose to tail and top to bottom in an professional and expert manner. We also provide appraisals, offer spot charters, arrange interchange agreements, and manage refurbishments and outside maintenance. KaiserAir’s model of shared resource management provides efficiencies that will reduce costs without reducing quality of service. Included in KaiserAir’s management fees are the support services of the President, Vice President of Maintenance and Ground Operations, Chief Financial Officer, Vice President of Quality Assurance, and Chief Pilot. We have been managing aircraft before there were Gulfstreams to manage! KaiserAir began as the flight department for the Kaiser family of companies and it grew into one of North America's premier management services for other Fortune 500 companies. While we have a very exclusive client list from some of the top global corporations and leaders, we treat all our customers with the same respect, courtesy, and compassion that we would like to be treated ourselves. Click here to learn more about our expertise buying and selling airplanes that suit all types of budgets and requirements. KaiserAir's flight operations department is a key component of our success.